What is better than keeping your prized coins at home in a display case? Well, while most collectors are men who prefer to collect coins as commemoratives, many women prefer to wear their coins as jewelry. In fact, for thousands of years, women have enjoyed wearing coin jewelry. The Royal Issues with King Kamehameha the Great, King Kalakaua, Queen Liliuokalani and the stunningly beautiful Princess Kaiulani are always popular. 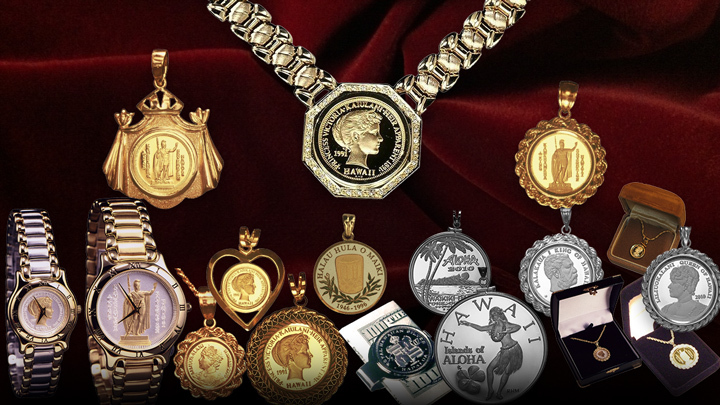 Available in gold and silver with masculine and feminine jewelry styles and mounted in different coins frames as pendants and watches, all the Royal coin jewelry is an increasingly popular way to enjoy your coinage by using it.